We often have clients asking us what the difference is between a natural stone bathtub and our AquateX™ Solid Surface bathtubs, and it’s a very important question because you want to make sure that you select the right type of stone to satisfy your needs. So, whether you decide you're going for natural stone or engineered solid surface stone, there are a few considerations that you need to take into account when making your choice between the two. Natural stone is exactly what its name implies, completely natural forming stone, which has existed forever and is quarried at various locations all over the world. Depending on the location that the stone is quarried will determine its color and the type of stone and shape that it takes. Natural stone is completely unique and every piece will be different, with no two pieces alike. There’s no guarantee that a natural stone bathtub is stain, scratch or chip resistant, and this is a common complaint about natural stone as no one can guarantee Mother Nature’s product. Natural stone also has a very large spectrum in terms of color, style, structure, porosity, and price. It’s mostly this large variation in color and veining that accounts for the main difference between natural stone and solid surface stone. When it comes to natural stone, the price can never really be determinant of quality or function, as a higher priced piece can actually turn out to be porous, making it softer and easier to scratch, so it’s always advised that when choosing a natural stone bathtub or bathroom piece, that price alone should never be the deciding factor in choosing which stone is best for you. As you may conclude from the above description, natural stone can sometimes be very unpredictable, even though it is unique, natural stone is natural stone and can be an incalculable material for bathtubs. 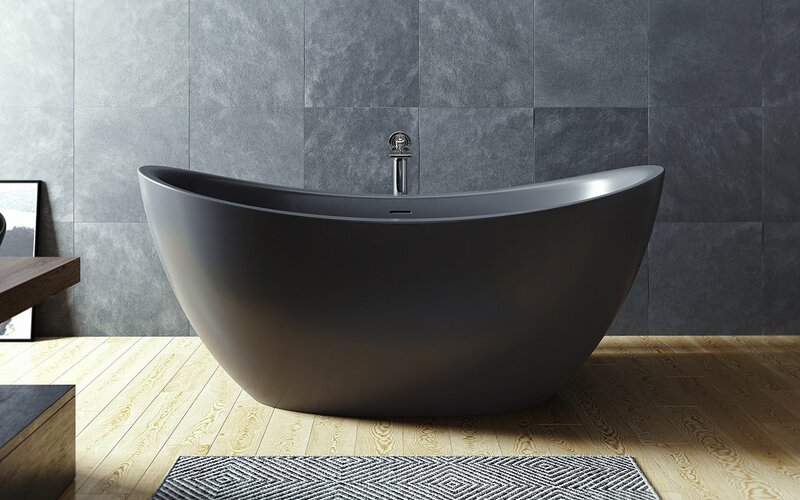 Composite stone or solid surface materials like AquateX™ can offer a solution for the wide public who tend to want to avoid unpredictability’s but also still want to stone in their bathrooms, and more particularly, bathtubs. AquateX™ is a technologically advanced solid composite material, which has been meticulously developed by Aquatica® and has been specially designed for bathroom pieces to last a lifetime. 60% of AquateX™ has been composed of an aluminum mineral which has been derived from bauxite, a deeply weathered volcanic rock. 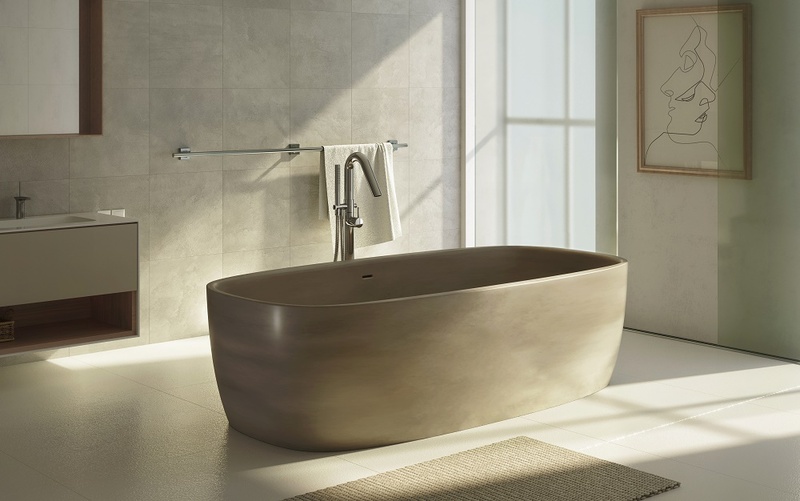 By combining a high percentage of all the best properties of natural materials; and a low percentage of state-of-the-art acrylic resins; Aquatica was able to create a desirable, high-performance material which is specifically, suitable for high-end bathroom applications, specifically bathtubs, and washbasins. Strong and durable, but not indestructible. Natural stone can be damaged by excessive force or sudden fluctuations in temperature. Natural stone can be damaged by excessive force or sudden fluctuations in temperature. Highly Durable – even more than natural stone, AquateX™ bathtubs and sinks will outlast most other materials. Any possible damage is repairable by a specialized technician with little effort. Porous. In order to prevent staining and, more importantly, the harboring of germs and other icky stuff in the stone’s nooks and crannies, all natural stone bathtubs need to be sealed top of their natural surface. Non-Porous - AquateX™ can be cleaned with a simple abrasive detergent and Scotch-Brite™ sponge, which can remove everything from cigarette burns, ink, hair dye, crayons, wine and coffee stains. Frequently cleaning an AquateX™ product will ensure the preservation of its original beauty.